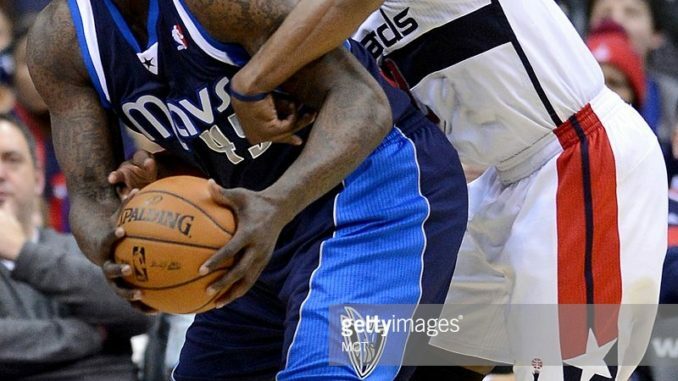 DeJuan Blair only played one season for Dallas in 2013-14, but ask any Mavs reporter or fan and you will only hear positive things about him. In his lone season in Dallas, he played a classic Rick Carlisle role in the 3 man bench big rotation including Brandan Wright, Samuel Dalembert, and DeJuan Blair (as well as Bernard James occasionally). Per 36 minutes, Blair averaged 14.7 PPG, 10.9 RPG, 2.1 APG, and 1.8 SPG on shooting splits of 53.4/0/63.6. Blair’s skillset was advanced for the era of basketball he played in. While 5 seasons ago doesn’t seem like a long time, the league has changed quite a bit since the time that Blair was playing at his peak. In 2013-14, the NBA team leader in 3PA was Houston with 2179. In the 2017-18 season, all but 8 teams took more than 2179 threes. However, threes were not a part of Blair’s game whatsoever. A more relevant stat is the amount of assists per game from power forwards compared to just 5 years ago. In 2013-14, the top 5 power forwards in assists per game ranged from 3.1 assists per game to 4.3 assists per game- a stat that former Maverick Josh McRoberts led that season. Compare that to the 2017-18 season where the league leaders at PF for assists per game was at 7.3, and 8 power forwards had 2.5 or more assists per game. The areas of weakness that plagued Blair in his NBA time were injuries/ bad knee durability, a lack of a three point shot or a reliable jumper, and his often subpar defense. While those areas were masked in his lone season with Dallas, they’d still be an issue in the modern NBA. In particular, the jump shooting would be hard to overcome while being a subpar defender, even if he would be run in lineups primarily against other bench players. While the roster and PF depth is already full and quite strong, Blair would probably carve out a role as a backup PF in a split role with Dwight Powell, and would likely completely eliminate Kleber from the rotation on most nights. A lineup of Barea-Brunson-Barnes/Matthews-Blair-Dirk would be one of the most versatile lineups this hypothetical Mavericks team could run. Everyone can create for someone or themselves at a good level, and they all have a high basketball IQ. DeJuan Blair played a key role in the playoff series versus the Spurs before getting suspended for a kick to the head of Tiago Splitter. Per 36 minutes, Blair averaged 17.8 PPG, 16.4 RPG, and 5.3 SPG on 59% shooting. Obviously those numbers are a bit extreme since he only played 13 minutes per game, but his presence was valuable. The steals number is very high because he had two games with 4 steals in the series. His highlight of the series was Game 6 when he had 10 points, 14 rebounds, and 4 steals in 28 minutes. While it was just one year, Blair had a solid impact as a bench piece with the Mavericks. If the Mavericks could find a player with the impact of DeJuan Blair off the bench each year, they’d likely continue boasting one of the top benches in the NBA each season. Every team could use a good rebounder that can play the passing lanes well, as well as possess some point forward traits. With better knees and athleticism, someone with his skillset is needed off of any bench.